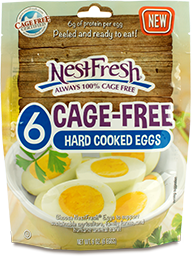 NestFresh Cage Free Hard Cooked Eggs are a convenient and easy snack and meal prep solution with the farm fresh taste that you love. Each egg is peeled and ready to eat to give you high quality protein on the go. 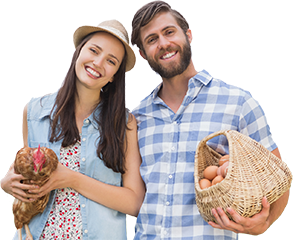 They are 100% cage free and come from family farms committed to humane animal care and sustainable agriculture, so you can feel good about each delicious bite. 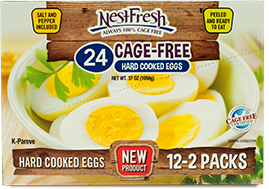 Try our Cage Free Hard Cooked Eggs and Organic Hard Cooked Eggs as protein-rich snacks or as ingredients in your favorite egg recipe. 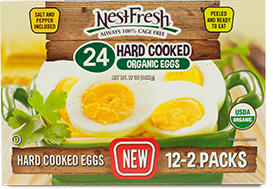 Click here to find NestFresh hard cooked egg products near you. Need them in bulk? 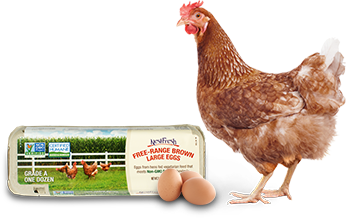 We offer customized bulk egg programs and products to meet the needs of our food service and manufacturing customers. 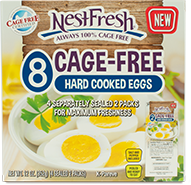 Hard Cooked Cage Free Eggs are classic NestFresh with a ready to eat spin—free of cages, antibiotics, hormones, and harmful chemicals. They make the perfect snack. 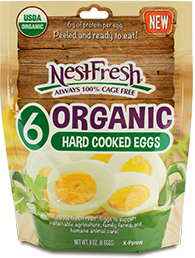 NestFresh Hard Cooked USDA Organic Eggs are laid by hens that are fed an all organic diet, made up of organic grains and plants the hens find while roaming in their free-range pastures.